Want a portable, gig-ready valve combo that packs a punch, but for sensible money? Look here. Build quality. Price. Versatile tones. Crunch balance control. Marshall has been a hive of activity of late, with a string of high-profile releases including the new solid-state MG series, the low-cost Haze series and the Class 5 combo. Marshall's historical lifeblood is its 50- and 100-watt models, however, a market that's been attacked in the mid-price range from all fronts. It's a good time then for Marshall to release its new bread-and-butter amp range - the MA series. We spoke with Marshall's head of R&D, Laurent Veignal, to learn more. "We were losing share in the low-end valve market," he says frankly, "and we wanted to have something to compete in that segment. That was our first and most important decision, because we know we can really compete - we've already got a range of successful OEM [Original Equipment Manufacturer] products with the MG series." He continues: "However, so far we haven't entered the all-valve OEM market and we didn't want to be seen to be left behind." Before MA, Marshall's least expensive all-valve, 100-watt head and 50-watt combo was the Vintage Modern series VM2266H head (£845) and the VM2266C combo (£894). So, who is the new range aimed at specifically? "The series runs between 50- and 100-watt head and combo variations and so really it's aimed towards people who are actually gigging - in pubs and other such places," says Veignal. Marshall has the strongest brand of any amp company, so as you'd expect the MA range pays homage to its forebears with a front-mounted gold control panel, the same black vinyl Marshall has been using for 15 years and black grille cloth, but with black piping, as opposed to the usual white found on the UK-made amps. The combo's straightforward front panel makes it - on paper at least - a no-frills, easy-to-use amp. Laurent adds: "The idea was to try to minimise the amount of controls on the front panel, but also allow you to maintain maximum flexibility and efficiency to tailor your sound on stage." The MA has two channels - clean and overdrive - with an overdrive boost for added versatility. The clean channel feeds a standard three-band EQ, which is followed by a clean volume control. The overdrive channel, however, is a slightly more involved prospect, especially with the intriguing inclusion of Marshall's new 'crunch balance' control - more on which later. Other than that, the overdrive channel features gain, bass, middle, treble and volume controls. There's also a master control section for the built-in Soho acoustic spring reverb unit, plus resonance and presence controls. Channel selections are indicated by green (clean channel) and red (overdrive channel and overdrive boost) LEDs. Two switches on the front-panel enable you to switch between them manually. As mentioned, the MA features the new crunch balance control. To use and understand it, it's helpful to think in reverse - start by setting gain and volume levels for your desired boosted solo or highest-gain tone, deselect the overdrive boost, then work with the crunch balance to set the gain for your rhythm sound. Doing it that way means you don't affect the overdrive boost's tonality and reduces the need to build-in another EQ section for the overdrive boost. Simple and neat, it keeps the feature-set uncluttered, cost-effective but still versatile. The supplied Marshall footswitch helps ensure maximum versatility for live performance by giving a number of selectable tones. For example, clean to overdrive, clean to boosted overdrive and overdrive to boosted overdrive. 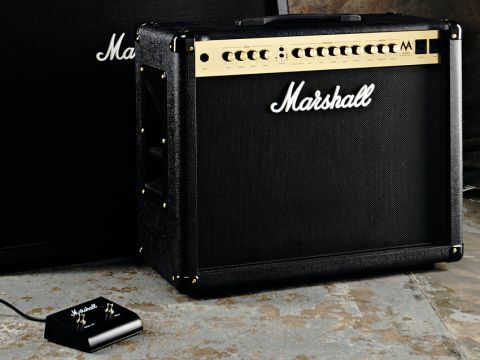 Again to keep costs down, Marshall has opted for particleboard cabinets instead of ply and the combo has three ports at the rear, which serves to keep the bottom end tight and full, but releases enough air to stop the cab sounding overly directional or boxy. Alongside this, the new back panel - according to Marshall - serves three general purposes; it offers the right acoustics, satisfies the health and safety people by protecting the user from the valves (instead of the more expensive metal cage option) and finally it provides adequate venting for the tubes. While we're round there, the back panel features a serial external effects loop with send and return sockets and effects bypass switch; 8- and 16-ohm impedance options, footswitch input and IEC mains connector. Side handles help with portability and tough plastic corners give extra protection. Powered up, the MA50C's clean channel proves quick and easy to dial in. The immediate clean tone is right in that traditional EL-34, Marshall ballpark - glassy in the top-end, hard midrange and solid bass response - great for live use, though a little tough for homely ears, or those used to the roundness of a Fender-style clean tone. To sweeten things up, you can always add in a dash of available spring reverb for a more elastic feel. The clean channel stays relatively 'clean' right up until the volume control is on full tilt, when it presents some grit around the edges. Working back-to-front; switching in the overdrive boost reveals a substantial volume jump from the normal overdrive channel, and with the gain set around halfway it offers huge, adrenaline-fuelled high-gain overdrive tones similar to Slash-style lead romps and a couple of hard rockin' JCM800s. That said, it handles roaring modern metal tones well too. The overdrive channel is a more measured affair. It's Marshall classic rock to its core and allows you to really dig into those rhythm sections of the song, suiting all manner of classic guitars from Teles to Les Pauls. And in that respect the MA50C does an impressive job of letting through plenty of your guitar's inherent character too. That's relatively unusual among lower-priced amps. The crunch balance enables you to really differentiate between the rhythm and solo modes while maintaining the gain and volume presets for the boosted mode. The key to great tone here is balancing the overdrive volume, gain and crunch balance controls carefully. We find that the best results come from setting the control just over halfway - offering thick AC/DC-style sounds that can still edge on blues-rock solo tones. If you fancy something a little wilder and gainier, however, you can crank the control to produce a distinctly heavier sound. The MA50C's cabinet sounds big and expressive for a 1 x 12 and the matched Eminence AX-75 offers a very welcome 'player's feel' to proceedings. Couple that with the relatively easy lugability and you've got a capable gigging combo here. The MA series is an impressive step into the low-priced valve amp market for Marshall. Designed to appeal to serious minded players on a budget, or those keen for their first all-valve experience, the MA series offers you a no-brainer choice - especially those with blues-rock to heavy rock and metal tastes. At 50- or 100-watts, though, this series is definitely not for bedroom heroes - they sound and perform best when cranked up loud to proper gig levels. The MA50C is well put together and tonally versatile, making it ideal as a go-anywhere, small-medium gig and rehearsing amp. All in all, we're talking superb value for money, no-nonsense noise machines that say Marshall on the front: none more rock!